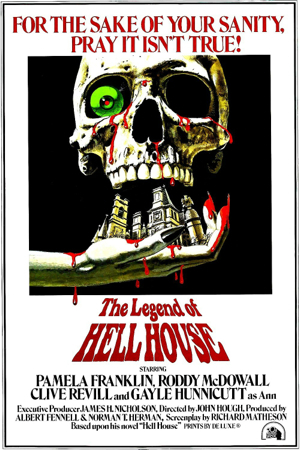 The Legend of Hell House, like the novel on which it is based, Hell House, was written by Richard Matheson. Watching it, you feel as though it almost had to be. It seems more like a companion piece than a work in its own right. The body of the story is there, but the connective tissue is missing. The individual parts aren’t so much scenes as vignettes, each of which imparts another important plot point. I suppose for that reason it’s comprehensible without having read the book, but it’ll probably leave viewers who haven’t feeling as though they missed something. The story, of course, is the same, relocated to England. A dying rich man hires three investigators to settle the question of survival after death in the only place he knows where such an answer might be found: Hell House, a haunted mansion that has already defeated the efforts of two previous teams to solve its mysteries. The team consists of physicist Lionel Barrett (Clive Revill), mental medium Florence Tanner (Pamela Franklin), and physical medium Ben Fisher (Roddy McDowall). Accompanying Dr. Barrett is his wife, Ann (Gayle Hunnicutt). The primary team members are all professionals, all experienced in dealing with hauntings. This helped make the book atypical in that fear wasn’t driving the characters. It’s the same thing here, but now it’s just another part of the overall tonal flatness of the film. Oh, there’s some yelling and there’s some screaming, but it’s all just bumps in the road. This isn’t a scary movie. It’s ominous, from beginning to end. Matheson unfortunately kept his ending more or less intact. I thought it was simplistic in the book; it’s sillier here, although it has some nice special effects as one of the team members gets pushed around. The special effects, in fact, are good throughout. The actors do well across the board and the movie is well-made. The real reason to see it, though, is for a taste of something different.